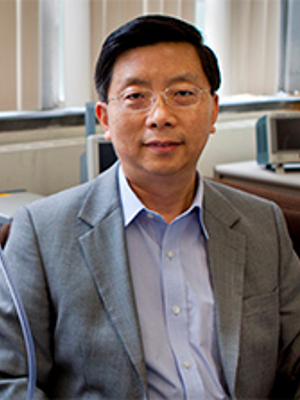 Dr. Robert Gao joined the department in September 2008. He was formerly a professor of Mechanical & Industrial Engineering at the University of Massachusetts, Amherst. His research spans the areas of physics-based sensing methodology, smart structures and materials, energy harvesting, non-stationary time series analysis, wireless communication, biomechanics, and energy-efficient sensor networks with applications to the health monitoring, diagnosis, and prognosis of manufacturing equipment and processes. Dr. Gao holds four patents, and is a Co-Editor of the book “Condition Monitoring and Control for Intelligent Manufacturing” (Springer 2006). He is currently an Associate Editor for the ASME Journal of Manufacturing Science and Engineering and the IFAC Journal of Mechatronics. He was an Associate Editor for the ASME Journal of Dynamic Systems, Measurement, and Control and the IEEE Transactions on Instrumentation and Measurement. Dr. Gao received his M.S. (1985) and Ph.D. (1991) degrees in mechanical engineering from the Technical University of Berlin (TU Berlin), Germany. He is a recipient of the NSF CAREER award (1996), a Fellow of the ASME and IEEE, and a Distinguished Lecturer of the IEEE Electron Devices Society.